The British TV series Doc Martin (a “dramedy” shown in the U.S. on PBS) takes place in the fictional seaside village of Portwenn and is filmed on location in the small quaint picturesque village of Port Isaac on the north coast of Cornwall. There are two small quaint picturesque arches nearby (which as far as I know have not been seen in the ongoing TV show). 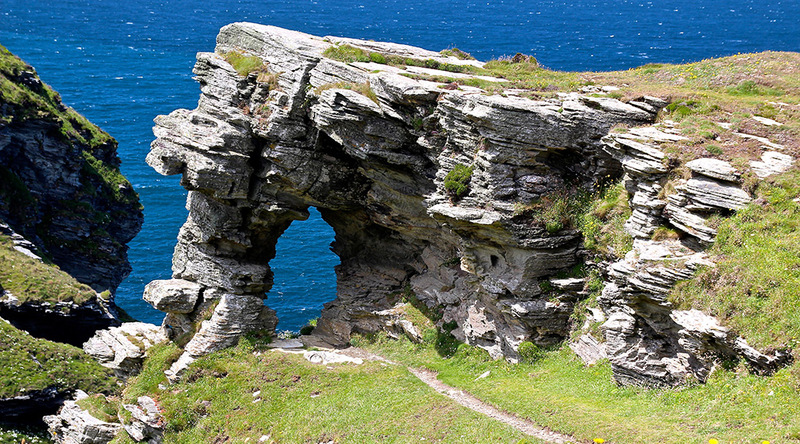 I have seen this arch called by its singular name Lady’s Window on the Internet but it is marked on the Ordnance Survey map as plural so I will use the plural form. It is about 7 miles from Port Isaac roughly midway between Boscastle and Tintagel, legendary site of King Arthur’s Camelot. It is near the small village of Trevalga just off the coastal path to the west. The opening is barely visible from the path but there is a wooden post marking a grid point by the arch. The photo was taken from a nice bench where you can sit and look at the views. It is at 30U-378275-5616085 and has a span of 6 feet and a height of 9 feet. 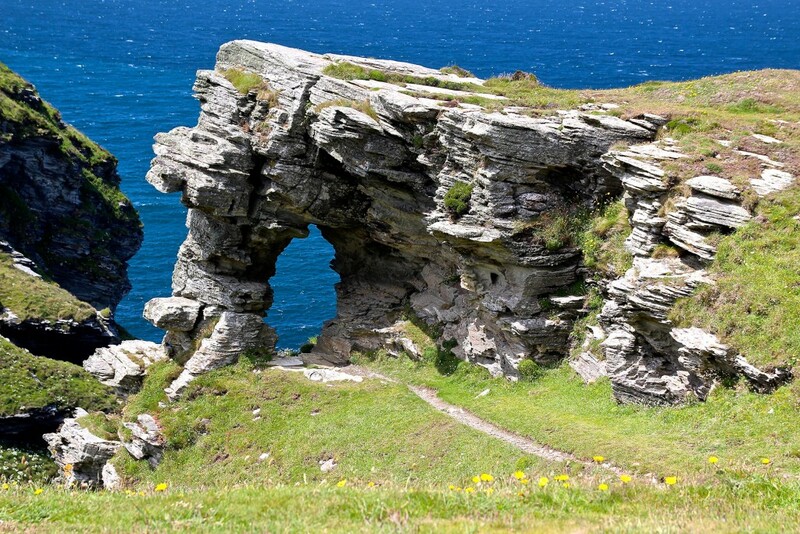 This waterfall natural bridge is close to the village of Trethevey and there is a parking area for it off the road from Boscastle to Tintagel. When I was there about 10 years ago I had to walk a two track road that led to a small cafe and tearoom. Here steps lead down to a waterfall about 60 feet high where the River Trevillet has punched a hole through the kieve (basin). A fee is charged. There is now a one-mile trail that goes alongside the river before climbing up to the tearoom. 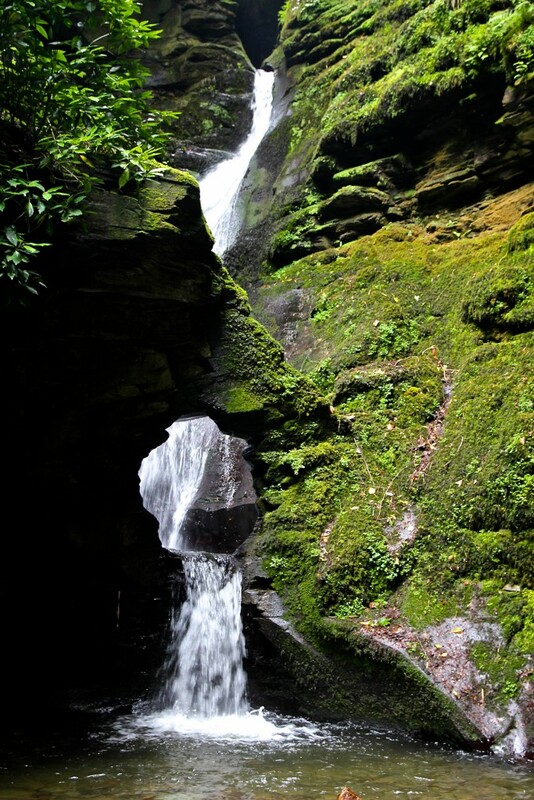 The sixth century Saint Nectan is believed to have had a hermitage above the waterfall and is said to have rung a silver bell to warn shipping about the rocks at the mouth of the valley. It is said to be a mystical place where fairies, piskies (Cornish pixies) and spirits play. Visitors often leave ribbons, crystals and bells on the rocks and foliage. There are a number of small piles of flat stones by the bridge known as fairy stacks. It is at 30U-378734-5613967. It probably has a span of about 8 feet and a height of about 9 feet (maybe less). 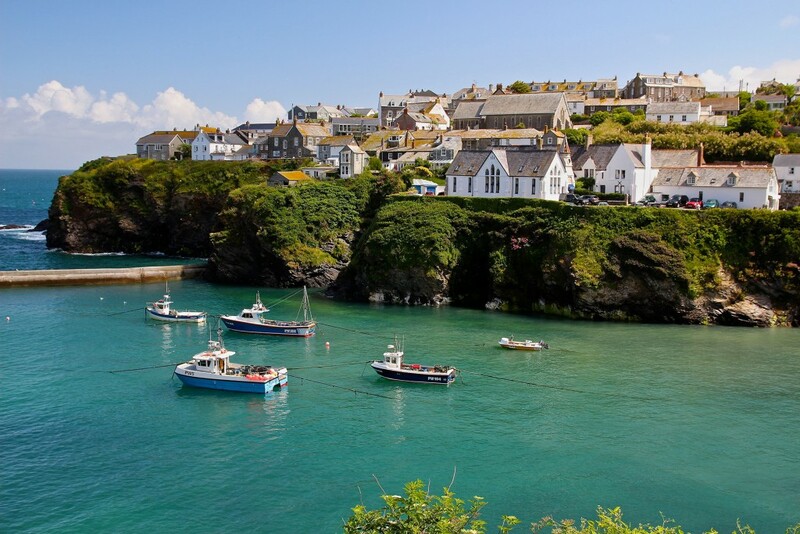 A couple of photos of the village of Port Isaac are below. 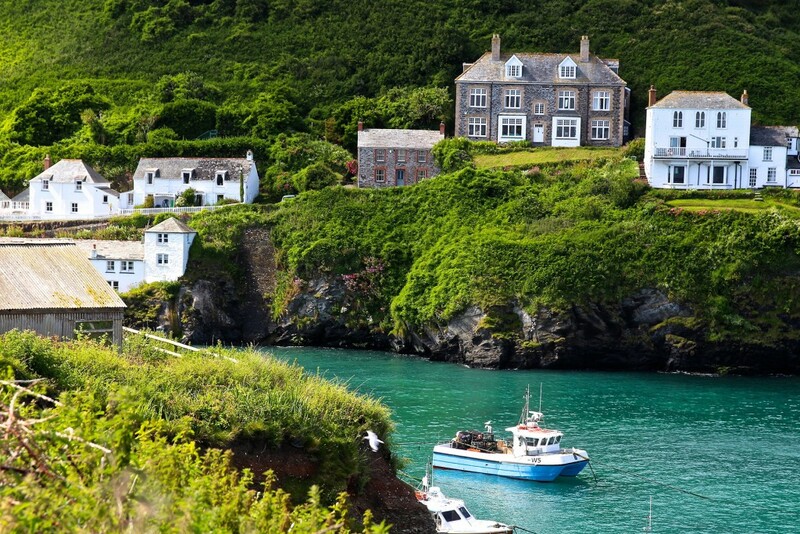 Doc Martin’s house is the smaller one in the center of the first photo.